One day last fall as I headed out for a morning walk, my neighbor stopped me as I strode past his house. Yes, I know,” I replied, suddenly feeling like I had walked into a Leslie Nielsen movie. Ron explained that another of our neighbors owned the infernal machine, but it needed a complete engine overhaul to the tune of $300. I remembered at that moment that I had broken my snow shovel toward the end of last winter. I made a mental note to buy a new one. 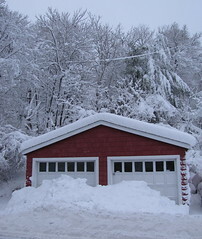 The owner of the snow blower, Ron continued, was proposing sharing the cost of the repairs among five or six neighbors. In exchange, all of the investors could use the snow blower over the course of the winter to clear their driveways and walks. Ron would store the machine in his locked garage and give us all the keypad code. Five neighbors had already agreed, Ron said, and if I joined in, each one would only have to pay $50 instead of $60. “I’ll think about it,” I told Ron, and continued on my walk. In my mind, I saw visions of last winter, when it snowed a foot every Thursday, whether we needed it or not. None of us were getting any younger, and the prospect of flirting with hernia through another backbreaking winter of shoveling held little appeal. Still, it all sounded vaguely communistic to me. Fifty bucks to share a snow blower? What’s next, $175 for a new school building? Where would it end? Over the next several weeks I thought about it. At one point I almost wrote a check. But I procrastinated. The rest, as they say, is history. Last week’s Blizzard of 2012 notwithstanding, this may go down in Greater Boston’s weather history as “The Winter That Couldn’t Snow.” Not only were there no big storms, but every time a forecaster issued a gleeful prediction of “one to three inches,” it also failed to materialize. It was as if Old Man Winter forgot to pick up his Cialis prescription. I admit that my superstitious side worries that I may jinx this glorious winter with that last remark. I sure hope Old Man Winter has a sense of humor. But there’s no denying that whatever happens from here on out, this has been an easy winter. I kept my promise to Ron. I did think about it. In fact, all winter I’ve been thinking about that rebuilt snow blower gathering dust in Ron’s garage and the $50 still in my wallet. 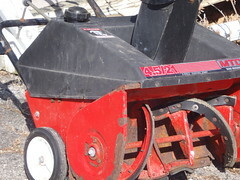 Snow blower photo by Wendy Soucie.